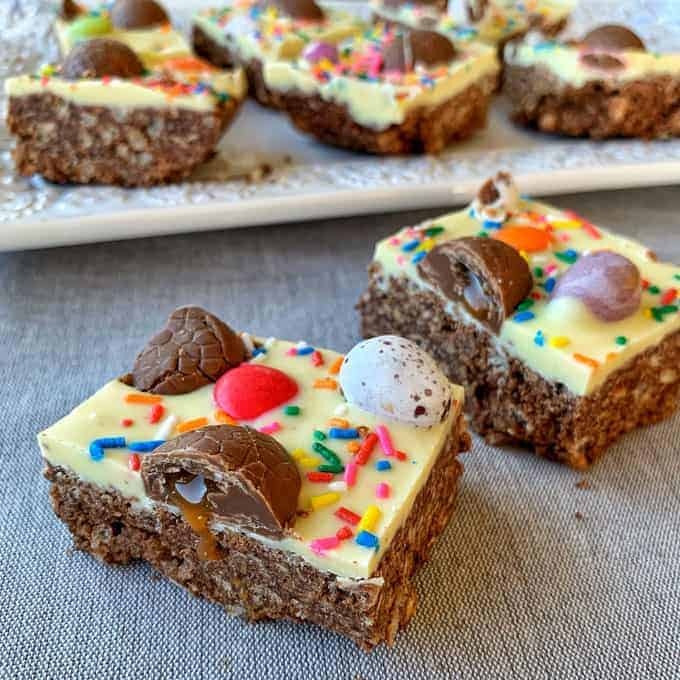 This no bake chocolate Easter egg slice is topped with delicious white chocolate and loads of Easter eggs, such a decadent sweet treat. I picked up all of the ingredients for this amazing no-bake slice from my local Countdown. 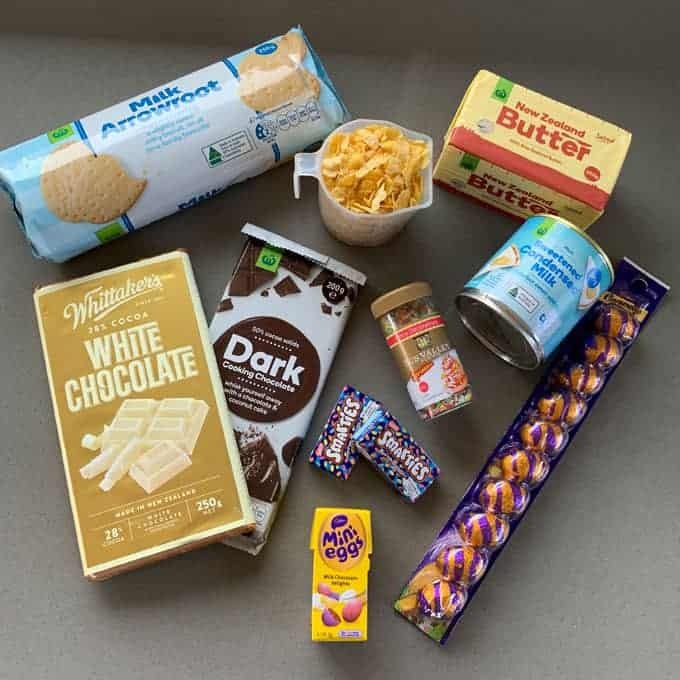 They have a huge range of Easter eggs and quality own-brand baking products with a lot of them on Price Lockdown. 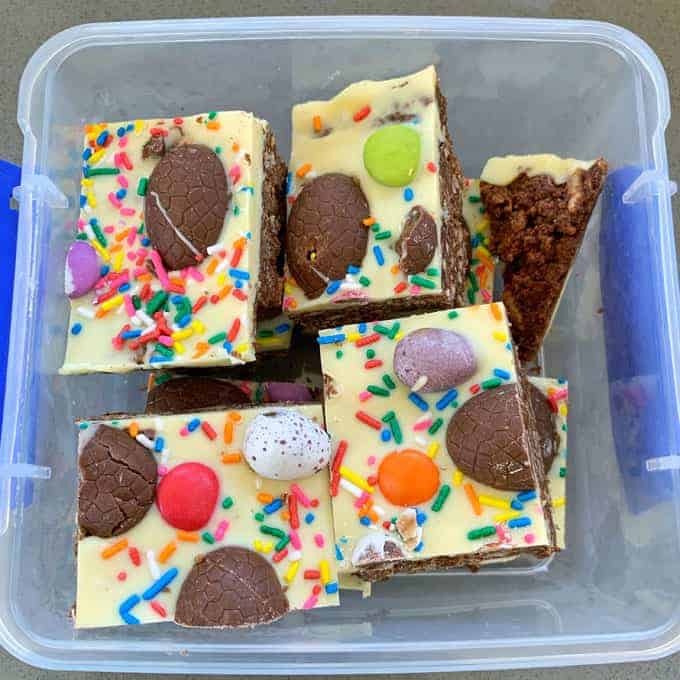 This is one of my favourite Easter recipe hacks because you can make it up to a week in advance and keep it in the fridge. Then you can bring it out to impress your family if you are having an Easter weekend gathering. 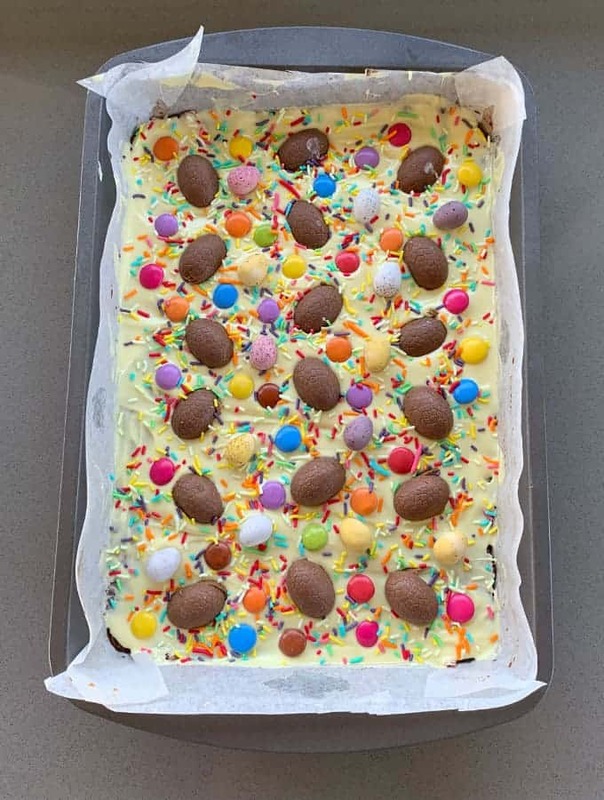 This no-bake Easter egg slice is topped with melted white chocolate, loads of eggs, Smarties, Caramello eggs and sprinkles and how fun does it look?! For the base you can use cornflakes or rice bubbles either of them works. I think I prefer the texture of the cornflakes but my husband Mike prefers the rice bubble option, so just use whatever you have on hand. No-bake slices are so much fun to make and one of my tricks while I have the food processor out is to crush any extra packets of biscuits I have. I then put them in a jar and write on the jar with a whiteboard marker what they are. 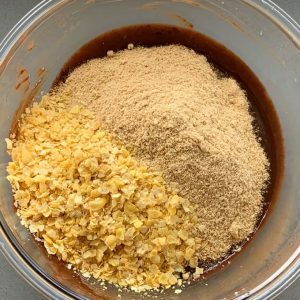 This way next time I make a no-bake slice the biscuits are crushed up and ready to go and I don’t have to wash my food processor again. 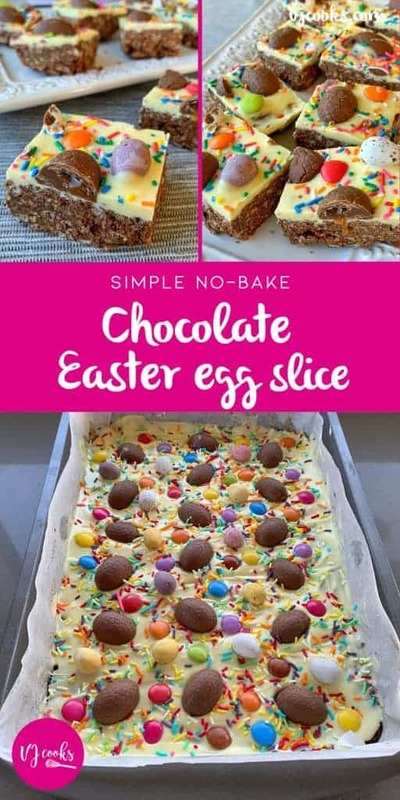 This slice is so versatile, you could top it with whatever Easter eggs you like, cream eggs chopped up would be amazing on top as well. 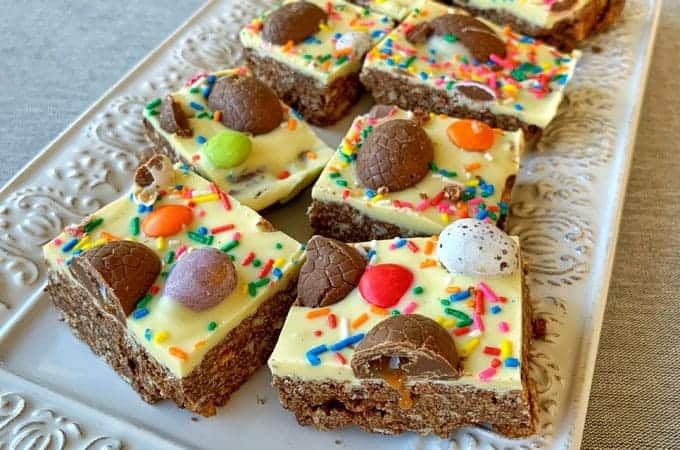 You don’t have to use white chocolate for the topping you could use dark or milk chocolate, whatever is your favourite, but I like the combo of the dark chocolate in the base, white chocolate on top and then and then topped with milk chocolate eggs so it has three different types on it. One trick for chopping up your slices to wait for around 20 minutes after taking it out of the fridge so it warms up, then it will slice easily without the top cracking. I like to keep my slice in an airtight container in the fridge. It will keep in there for up to a week but I’m sure it won’t last that long as it doesn’t last long in my house. 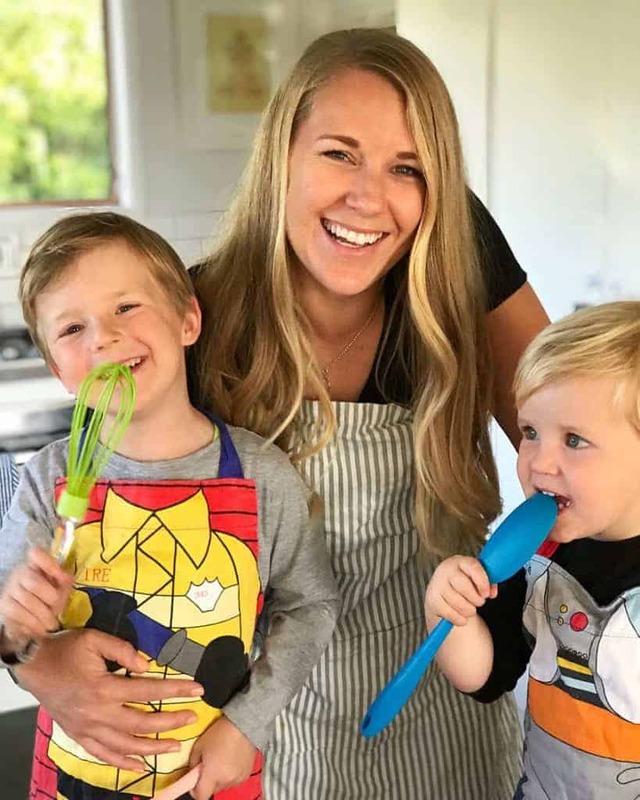 I hope you like this recipe as much as my family does and please be sure to tag me or send me photos if you make it on Facebook or Instagram. This super easy no-bake slice will be sure to satisfy any chocolate cravings! Line a 18 X 27cm slice tin with baking paper and set aside. Add chocolate, condensed milk and butter to a microwave-safe bowl. Heat in 30 second bursts until all the ingredients have melted together and stir well. Add to the crushed biscuits and rice bubbles then mix until all combined. Press the mixture into the tray, spread to the edges and smooth the top with the back of a metal spoon. 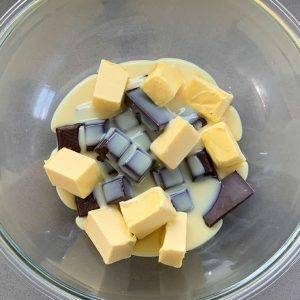 Melt the white chocolate in the microwave, add oil and stir until it is smooth. Pour the white chocolate over the base and spread it evenly to the edges. 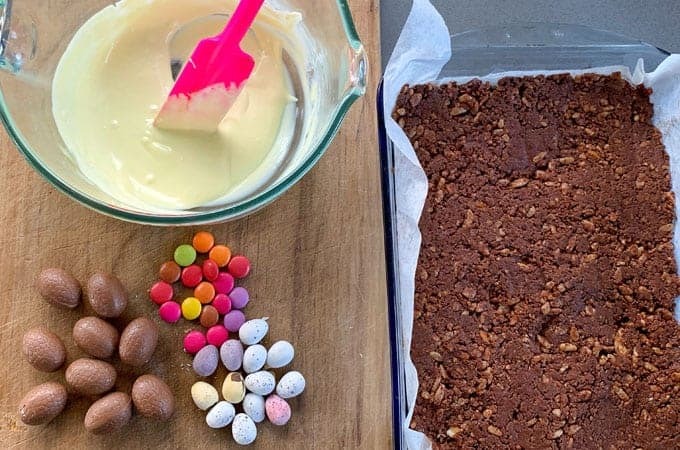 Cut the caramello eggs in half and arrange on top of the chocolate, add mini eggs and Smarties. Finally shake over the sprinkles. Chill in the fridge until set 4+ hours. Take out of the fridge 20 minutes before cutting into slices (this makes it easier to cut). Keep in an airtight container in the fridge for up to a week.